A selfie robot will automatically track your movement and take photos for you. The robot can also track several faces and will take a photo when it recognizes all of the faces. This new technology works with most Android Smartphones and iPhones which pair over a Bluetooth connection to the robot. The device is exactly what you think it is and works in a logical way that is controlled entirely by the Fiedora app found in the App Store or Google Play. The app itself could use some improvement however because the technology is so new it is expected that developers will make all of the improvements necessary to make this a coveted technology. The robot itself is small and has a cradle to hold your smartphone. It can be charged with a standard USB cable that can be plugged into your phone or laptop. A full charge only takes 1-2 hours and lights on the device will indicate how much of a charge the robot has left. Two indicators on the robot include the power button and front led light. The power button will glow green or red depending the amount of charge left. Red indicates a charge below 25%, Green indicates a charge above 25% and if the light is flashing either color it is indicating that is currently being charged. If the power button is not lit up red or green, it means it is switched off. On the front is a blue LED light. This light will let you know that status of your Bluetooth connection. If the blue led is flashing it means that the Bluetooth is switched on and is waiting to pair with your device (this will happen automatically when turning on the robot). A solid blue light indicates that it is paired to your smartphone while no light indicates that the robot is switched off. The first time you use the robot you will want to be sure it has a full charge. Just plug the USB cable into the micro USB connector on the back of the robot and plug the other end into any desktop computer or smartphone to begin charging. Allow the robot to charge for several hours. While your selfie robot is charging, install the Fiedora app found in the App Store or Google Play. This will app will put the automation into your robot. You can look through this app and the automation features it provides including face tracking, count down time to take the photo, etc. After your robot is fully charged you can pair it to your smartphone by navigating to the Bluetooth settings in Fiedora, turning on the selfie robot and allowing it a few moments to pair. No special pairing code is needed to link your smartphone to the robot. After the robot is paired, place it in a well-lit room where it will be able to easily detect your face. Make sure the Fiedora camera mode is set to solo mode (one face), set the face tracking countdown to 2 seconds and proceed to let it track your face. If at first it does not recognize your face well, try it in a different setting. Bright or poor lighting can negatively affect it’s performance. In the right setting it can snap numerous photos in a short amount of time, allowing you change your pose every few seconds, line up for the photo and wait for Fiedora to take the picture. However the Fiedora app itself could use a little bit of work, the selfie robot will help you to take stunning pictures of yourself and of you with groups of friends and family. 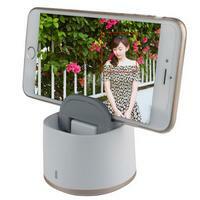 It allows you to take pictures without having to press any buttons or set timers to try to capture the best photo. When it detects a good photo, it lets you know and will give you an audible countdown to alert you that it is about to take a picture. We are certain that you will enjoy using the selfie camera robot and that it will help to capture some great moments for sharing over your favorite social media websites. This would be great for family portraits...no running against a timer! One of the neatest things I've ever seen. Thank you.